Return and face the music. Fallout: New Vegas, normally reactive, stops short of letting you continue the game and enjoy the ultimate consequences of your actions once the credits roll. It just ends. With mods, you can find a way around that and hop back in, but you'll find a world in stuck in the moments prior to the ending. Not so in the new FPGE mod, however, which creates a functional post-game ending. With FPGE, you'll find the world reacting to your big decisions when you return to Nevada. Factions can be wiped out, others might conquer regions, and the Hoover Dam can be taken over. "After two weeks, Hoover Dam is taken over by the respective faction and the fighting stops," reads the description on Nexus Mods. "The Kings will get eradicated by the Legion, if alive, the Brotherhood of Steel will take over Helios One and patrol the roads, and the Great Khans will evacuate their camp, taking everything with them. This is only a small portion of what can take place however, and there are a massive amount of things that change based on how you play." Modder Kazopert has also made some changes to dialogue. NCR citizens, for instance, won't start eagerly discussing all their new territory if they've actually lost the war, while soldiers won't talk about fighting the Legion if it's already been defeated. It should be consistent with most of your other mods, and it won't have any impact on the game until you finish the final quest. Download it and find installation instructions here. 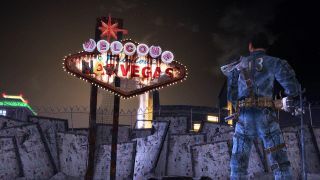 And if you're thinking of taking a trip back to post-apocalyptic Nevada, here are the best Fallout: New Vegas mods.